Plant-based diets and the environment — isn’t it about time we started talking to a wider audience about this? This attractively produced book will surely get people discussing these vital concerns for the future of the planet. Zacharias and Stone give plenty of evidence that a plant-based diet is also a “planet”-based diet. In a remarkably narrow space, the authors quickly cover seven key issues — land, water, food, energy, pollution, deforestation, and species extinction, showing how a single solution can address them all. 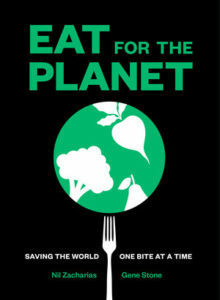 Eat for the Planet makes a vivid physical impression. Abrams Image, the publisher, is best known for its art books. This small (5″ x 7″) hardcover isn’t an art book, and is produced in only three colors — black, white, and green. But despite this it conveys the look and feel of a coffee-table book, only smaller, with graphics or call-outs on almost every other page. Almost all of the discussion is heavily footnoted, so people wanting to check the facts will not have far to go. Who is this book intended for? The visual presentation will appeal to young people. The authors make clear that it is also directed towards those who care about the environment — recycling, conserving energy, marching, and signing petitions — but who may also be eating meat. Vegans may be familiar with the broad outline of the environmental case for plant-based diets, but will also benefit from the book’s compact discussion of such wide-ranging concerns. The many facts combined with the relative brevity (many of the 160 pages are diagrams and graphics) are both the strong point and the weak point of the book. It has a huge impact by making some powerful points in a hurry. The authors cannot take the time to provide a lot of analysis (that would have been a VERY different book) and cannot include everything. The editing could have been stronger; there are some misspelled words, grammatical errors, and missing or inadequate footnotes. Some important subjects are not discussed (soil erosion, irrigation, groundwater depletion), while others of more questionable relevance to livestock agriculture are included (arctic oil exploration, fracking). Interestingly, the book cheerfully cites different answers to one key question: what percentage of human-caused greenhouse gas emission are due to livestock? On p. 74 a prominent graphic suggests that livestock are responsible for 14.5% of all human-caused greenhouse gas emissions. But elsewhere (p. 24, 79, and 80) it mentions another, much higher figure of 51% of greenhouse gas emissions from livestock (from WorldWatch). I’m actually glad to see some publicity for the WorldWatch report. Livestock’s unrelenting disruption of the natural carbon cycle in the biosphere is often short-changed in climate discussions. Readers are left with the appropriate footnotes to make up their own minds as to which figure (or some other) is most accurate. Anyone who reads this book will be unable to avoid the implication of the unrelenting cascade of facts thrown at them. There is a huge amount of damage being done to the environment by livestock agriculture. The solution is both inexpensive and amazingly simple: eat for the planet. Sounds like we should be suggesting this as general book club reads and requesting it at libraries for starters. It’s an excellent book, not the most in-depth but serves its purpose well. Fortunately, Mic the Vegan has already totally destroyed this study in his YouTube video, “If the US Went Vegan, A Public Health Disaster | REBUTTAL”. Thank you, Mic the Vegan. So if they start turning carbon dioxide into rocks and roads, and create clean gas through capture technologies, they won’t be able to deny that animal agriculture is the leading cause of global warming. True. But “predictions are difficult, especially about the future.” (1) Fossil fuels do have something to do with global warming (I mean, it does put CO2 directly into the air), so this approach could yield some results. And (2) it’s unlikely we’ll get that far and be able to put this to the test. It’s hugely expensive, we will need to spend kazillions of dollars and totally mobilize society, only to find it’s even more expensive than we thought when we run into further shortages, which generates further resistance, and so forth. Best to get it right the first time; you can waste a lot of money and time on an approach that doesn’t address the complete problem.